This Nairobi city tour includes a wavy drive of the city-in-the-sun with your tour guide. You will have ample time to visit and live the history of this great city. Interest points includes a visit to the City Market, where you can mix with the locals whilst browsing at stall selling locally made handicrafts. Also, you’ll enjoy short stops at the National Museum, the Snake Park and the Railway Museum. 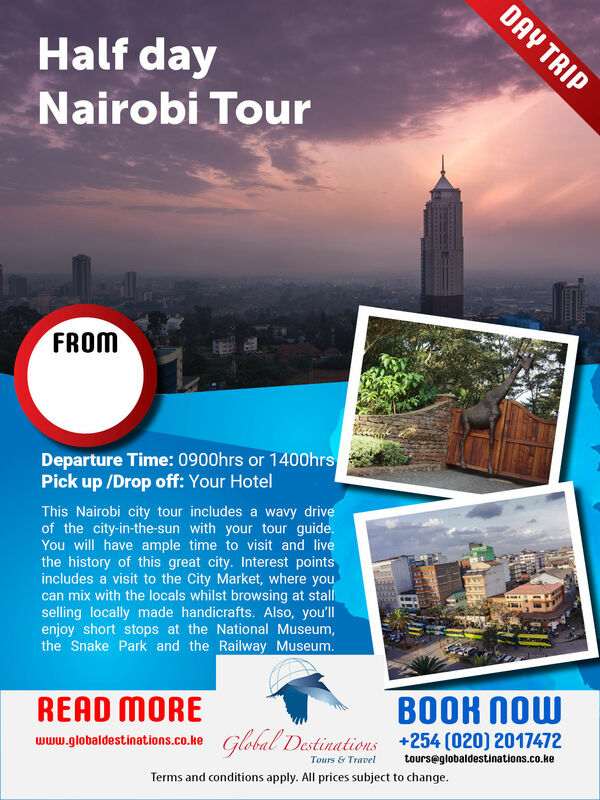 Your tour will pass slowly through Nairobi’s busy streets, viewing the parliament buildings and the well-known Kenyatta Conference Centre. Do not forget you camera to capture the culture of Kenya in its capital city. NB: The parliament building and the Kenyan flag or anyone in an armed force uniform should not be photographed.